African American gospel music incorporates elements of both black vernacular and sacred music, including blues, hymnody, spirituals, the folk church, and even popular song. While scholars agree that Thomas Andrew Dorsey is the most notable early gospel composer, other trailblazers preceded him, making significant contributions to the genre. Among them are Charles Albert Tindley, Blind Willie Johnson, Arizona Dranes, and Charles H. Pace. Though usually defined as songs with religious lyrics, gospel also describes a performance style. Vocalists use improvisations and embellishments of text, timbre (tone), and pitch to express emotions ranging from sorrow to joy, lament to hope. For instrumentalists, the aesthetic and practical approaches are essentially the same. Gospel instrumentation has expanded over time, with an early preference for piano and guitar making way for more contemporary renderings that include Hammond organs, keyboards, amplified instruments, drums, and auxiliary percussion. The tradition now includes the subgenres of contemporary gospel, urban contemporary gospel, and traditional gospel. 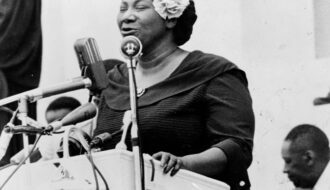 Two New Orleans natives, Mahalia Jackson and Emma L. Jackson, were influential during the early years of gospel. 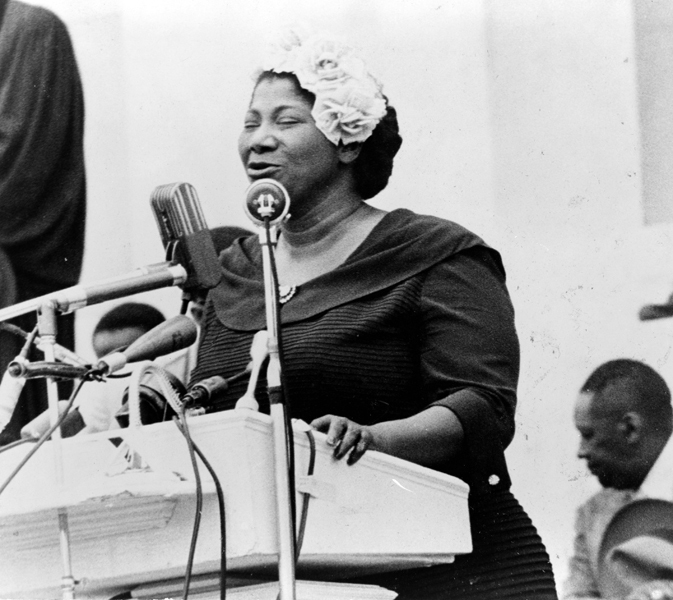 Often called the “Queen of Gospel,” Mahalia Jackson is celebrated as one of the genre’s greatest singers. Though born in New Orleans, she moved to Chicago in 1927. By the end of the decade, she had formed a musical relationship with Thomas Dorsey that lasted through the 1940s. Her recording career began in the 1930s and met with moderate success until the release of “Move On Up a Little Higher” in 1948. That song catapulted her to celebrity status. Garnering mainstream popularity, she took gospel music to concert halls and music festivals in the United States and abroad. Notable performances include an appearance in the 1959 film Imitation of Life. She also performed during the March on Washington in 1963, and at the funeral of Dr. Martin Luther King, Jr., in 1968. 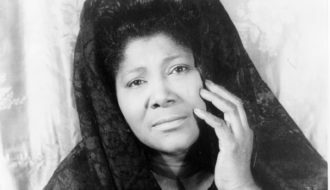 Mahalia Jackson is a gospel music icon, with biographies and recording compilations dedicated to her life and output. Also active in his period was Harvey H. Herron, a gospel music publisher, distributor, and composer, who operated his business in Baton Rouge. His compositions date back to the mid-1940s and include “Lord Keep My Hand In Thine” and “Do Not Let the Savior Pass You By.” The Herron’s Music and Bookstore was open for more than fifty years. Herron sold sheet music in his store until the late 1990s, even though recordings had become gospel music’s primary medium by the late 1960s. Finally, following in the tradition of guitar evangelists such as Blind Willie Johnson, Rev. Utah Smith was known as the “Two-Winged Preacher.” Born in Cedar Grove (now part of Shreveport) in 1906, Smith was highly regarded for both his preaching and performances on electric guitar. His signature song, “I Got Two Wings,” was first recorded in 1944 at a studio in New Jersey, and he occasionally played it while wearing two white wings. Subsequent recordings of this song followed. Among the most remarkable is a self-produced 1947 recording with his congregation, the Two Wings Temple Church of God in Christ, on the Two Wings Temple label, based in New Orleans. This recording is perhaps one of the earliest commercial gospel music recordings produced in the state. Rev. Smith’s career in ministry and music continued through the 1950s. Gospel quartets perpetuate a singing tradition in Louisiana that dates back to the 1910s, when an all-male group organized at Dillard University in New Orleans. As quartet singing grew in popularity, community and church groups such as The Delta Rhythm Boys, The Soul Comforters, and The Zion Harmonizers were all active by the end of the 1930s. These early quartets specialized in a cappella (i.e., without instrumentation) jubilee songs. After World War II and the birth of many independent record companies, the quartet phenomenon grew even faster. By the mid-1950s, a number of New Orleans quartets were performing and recording, including The New Orleans Humming Four, The Delta Southernaires, The Crescent City Gospel Singers, and The New Orleans Chosen Five. The Chosen Five recorded “I Shall Not Be Moved” in New Orleans at the historic J&M Recording Studios in 1947. Female groups such as The Jackson Gospel Singers and The Southern Harps also recorded during the early postwar years, and, in northern Louisiana, Shreveport’s Ever Ready Gospel Singers recorded during the 1950s as well. As traditional performance practices gave way to the contemporary sounds of the late 1960s, quartets evolved to include more instrumentation and a wider sampling of stylistic influences. However, most of the older, more established groups, like Baton Rouge’s Zion Travellers and the aforementioned Zion Harmonizers, maintained an allegiance to traditional singing and song writing. A number of Louisiana musicians have affected local and national markets for contemporary gospel. Chief among them is Bishop Paul S. Morton, who contributed to more than fifteen recordings during his twenty-five-year career in gospel music. He recorded as a solo artist and, as a featured performer, with the Greater St. Stephens Baptist Church and Full Gospel Baptist Fellowship choirs. His stirring renditions situate him among the leading figures in gospel music today. Joel Britton’s “We Offer Christ” (1992), from an early Morton/Greater St. Stephens recording, is one of the most enduring of the collaborations, and has been included in the African-American Heritage Hymnal. Other notable New Orleans contemporary artists include the late Raymond Myles and the gospel chart-topping trio, Trinitee 5 7. Moving away from the Crescent City, Ruby Terry resides in the Lake Charles area and is a state leader in the Church of God in Christ. She recorded her first album in 1989. Praised by critics, this recording demonstrated her versatility in both traditional and contemporary styles. Born in California, Micah Stampley spent his childhood in Baton Rouge, where he developed his skills as a singer and instrumentalist. Now one the industry’s most sought-after performers, Stampley won the prestigious Stellar Awards National Star Search in 2004. Shreveport native Jerard Woods is also among the rising artists in gospel music today. He has been a featured vocalist on stage and in recordings with leading figures such as Yolanda Adams, Joe Pace, and Ce Ce Winans. He released a solo project, I Waited, in 2007. Maxile, Horace "Black Gospel Music." In https://64parishes.org Encyclopedia of Louisiana, edited by David Johnson. Louisiana Endowment for the Humanities, 2010–. Article published February 1, 2011. https://64parishes.org/entry/black-gospel-music.